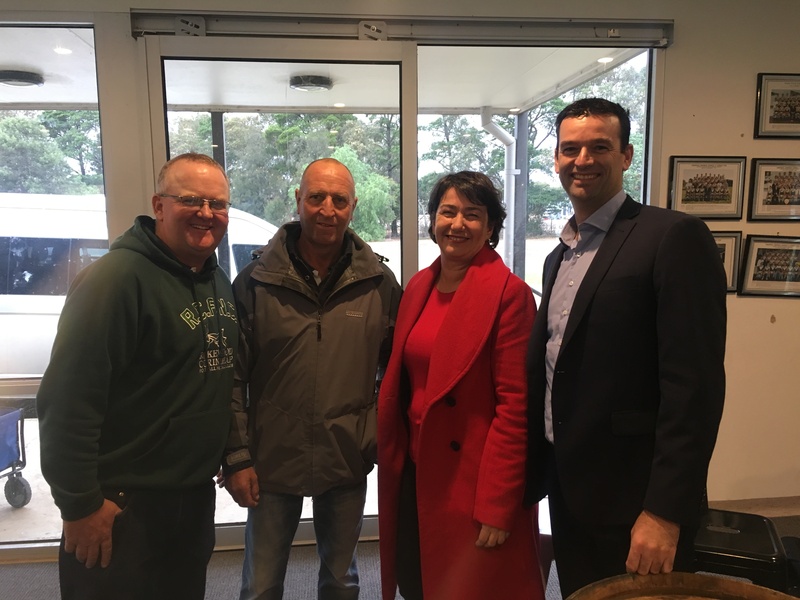 Golden Plains Shire Council welcomes the State Government’s funding announcement of $169,258 for the lighting upgrade at the Rokewood Recreation Reserve. Council successfully secured the funding grant through the Community Sports’ Infrastructure Fund and will contribute $115,000 to deliver the full upgrade project. The grant was announced by Member for Buninyong Michaela Settle MP to an enthusiastic crowd of Rokewood Corindhap Football & Netball Club players and supporters on Saturday 30 March. The new lighting at the Rokewood Recreation Reserve will meet the AFL standard for local football training and matches. Improved lighting means improved safety at the Reserve, as well as less wear and tear on the field as the full oval can be used for training. Importantly, the upgrade will support the club and Reserve committee to grow and strengthen their membership and schedule more matches, training sessions and events. Rokewood Recreation Reserve joins a list of Golden Plains Shire sporting ovals to benefit from new lighting upgrades. Construction of new lights at Linton Recreation Reserve is almost complete and in Inverleigh, local sporting clubs have been enjoying the new lights at the Inverleigh Sporting Complex since early last year. In February 2019, Council secured a Federal Government grant of $500,000 for new lights at both ovals at the Victoria Park Recreation Reserve in Bannockburn with works to begin after the football season. Mayor Cr Owen Sharkey says Council has lobbied hard for investment in new sport oval lighting at Rokewood Recreation Reserve. “The Rokewood Recreation Reserve is the only public multi-use recreation facility in town and as well as being a valuable gathering place for players, families, supporters and visiting sporting teams; the Reserve hosts a range for informal and formal sporting opportunities and events for the whole Rokewood community. “In Golden Plains Shire, our local footy clubs play a vital role in the cultural, social and sporting life of our towns and this lighting upgrade is a tangible way that Council supports the clubs and the people of Rokewood to go from strength to strength. “Improving community sporting facilities means the clubs can build the player rosters, increase their membership numbers and inspire local juniors to want to one day run out on their hometown field under the big lights. Pictured above (left to right) are: Adam Walton, Rokewood Corindhap Football & Netball Club President; Wayne Terry, Rokewood Recreation Reserves Committee Chairperson; Member for Buninyong Michaela Settle MP; and Mayor Cr Owen Sharkey celebrate the Rokewood lighting upgrade funding announcement on Saturday 30 March.